Xikar’s HP4 lighter in Daytona Red. Lighters come in all shapes and sizes, from large and imposing tabletop pieces all the way down to miniature varieties of classic designs. Then there are the in between lighters, pieces that are mid-sized, versatile and equipped to serve a variety of purposes, like Xikar’s HP4. This quad-flame lighter is still small enough to fit in your pocket, just as it’s large enough to sit upright on your coffee table without getting lost among the clutter. But the unique, medium-body size—combined with four robust jet flames—makes the HP4 an ideal lighter for active, on-the-go use. Consider it as the lighter you’ll store in your golf bag, hiking backpack or in the glove compartment of your car. The four jets are angled slightly inward, so the flames meet an apex to create a strong and balanced blaze. 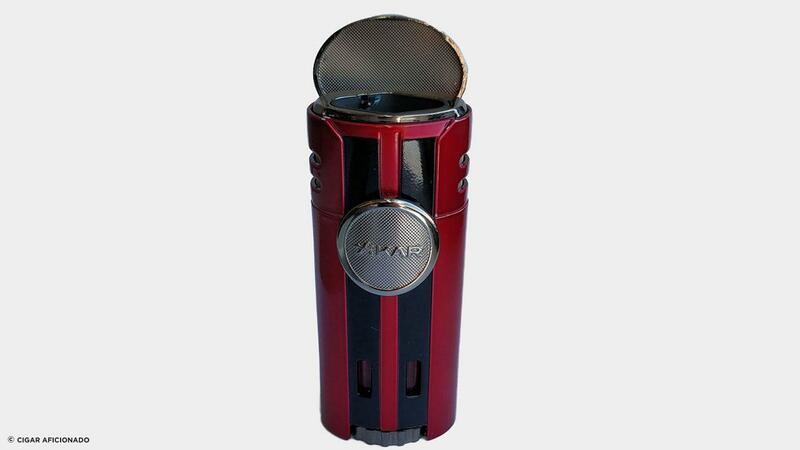 With a design inspired by high-performance supercars, each feature of the Xikar HP4 is a little bit bigger, and a little more powerful, than your standard jet-flame lighter. A light touch flips back the protective lid to reveal four sturdy jets, all angled slightly inward. Upon igniting the lighter, the four individual flames meet an apex to create a strong and balanced blaze capable of lighting even the largest ring gauge cigars. The pull-down ignition is plenty wide (roughly the size of a nickel) and effortless, as is the oversized fuel-adjustment wheel on the bottom of the lighter. A lighter with four hulking jet flames is bound to be a bit of a gas guzzler, so Xikar put two large windows in the front of the HP4, making it easy to monitor the butane level inside the voluminous tank. The lighter is equipped with oversized features, including the pull-down ignition and fuel-adjustment wheel. Overall, the metal casing is both durable and sleek. The only noticeable design flaw of the HP4 is the plastic back panel, which feels comparably flimsy against this otherwise sturdy design. Given its power and substantial size (3 1/4 inches tall by about 1 1/2 inches wide), you’ll quickly see why the Xikar HP4 is a great product for casual outdoor use or for lighting up with the windows down. The metal casing is durable and sleek, but the plastic back panel feels comparably flimsy against this otherwise sturdy design. HP4 comes in five colors, all of which retail for $119.99: Black, Blue, Chopper Orange, Daytona Red and a steel-color model called G2.